Plans for a proposed new inter-tidal wildlife habitat at Arne Moors, Dorset, will be unveiled next week at a drop-in event in Wareham. The Environment Agency is working with the RSPB and Natural England to explore how to adapt approximately 150 hectares of the Moors at Arne into a diverse wetland habitat. The scheme is necessary to compensate for the loss of inter-tidal habitats around Poole Harbour due to rising sea levels and the need to improve and maintain coastal defences. Next week’s drop-in event will be held on Tuesday (3 October 2017) at Wareham Town Hall from 2.00pm to 7.00pm. When finished, the coastal change project will enable the Environment Agency and its partners to continue to protect properties around Poole Harbour from the increased risk of flooding due to climate change. It is predicted up to 10,000 local properties could be at risk within 100 years. 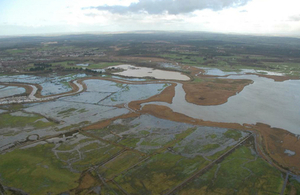 Important freshwater habitat and the Arne Road will continue to be protected from flooding as part of the scheme. The loss of inter-tidal habitats through climate change and improved sea defences is known as ‘coastal squeeze’. Compensatory habitats are needed to ensure birds and other wetland species are protected and still have places to rest and feed. It is important to us the local community is involved in this project right from the start, so please come along to the drop-in session and find out more about this exciting project. We would like to hear your views. We’re really looking forward to meeting people in Wareham and discussing the future of the Moors at Arne. During the day we’ll share more on the reasons why the proposals are being made and the implications for people, wildlife and landscape in this special part of Dorset.